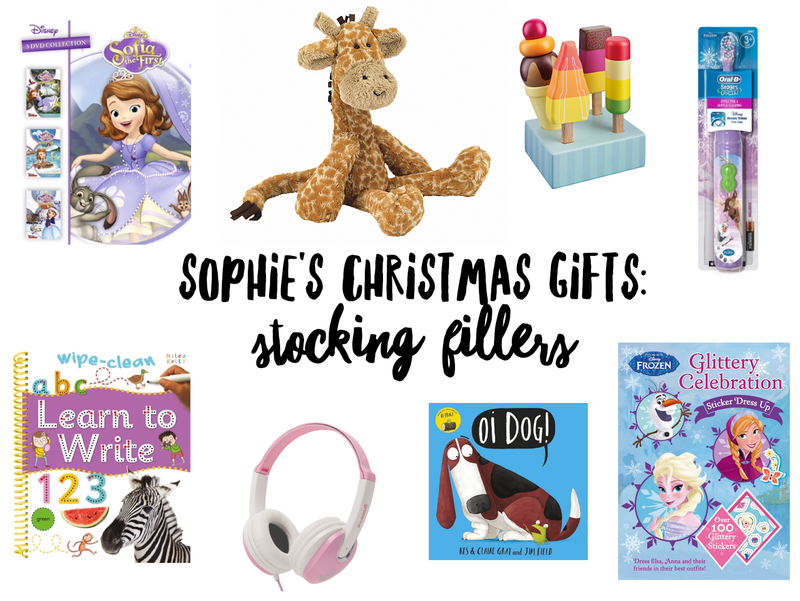 Today I'm sharing with you the stocking fillers we have picked up for Sophie, who will be turning three and a half just before Christmas. They are mainly the smaller and inexpensive items, which I thought would be perfect for her stocking. Sofia The First DVD Boxset - Sophie loves Sofia the First and although we have many episodes recorded on Sky, I thought the DVD's would be useful to take with us if we go on holiday or for the in-car DVD player for longer car journeys. Jellycat Giraffe - I've already mentioned previously how much we love Jellycat products, and Christmas is the perfect excuse to add to Sophie's collection! Frozen Electric Toothbrush - I thought this was really practical but I think she will love it, as it also has her favourite characters on it. Learn To Write Book - I picked this up in the Smyths Toys event in September and thought it was perfect for Sophie to practice writing letters and numbers, as she will be starting school next year. Headphones - We've bought Sophie a tablet as one of her main presents, so this is to go with it so I don't have to listen to it out loud anymore! Oi Dog! Book - One of Sophie's favourite books is Oi Frog! so I had to order the sequel and I'm sure she is going to love it. Frozen Sticker Book - I thought this was a lovely activity for Sophie to do at home. 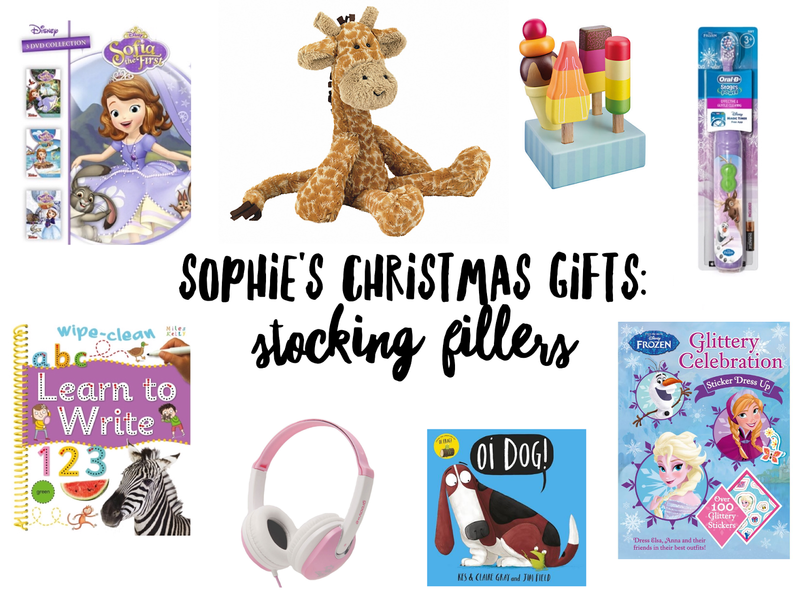 So there you have Sophie's stocking fillers! 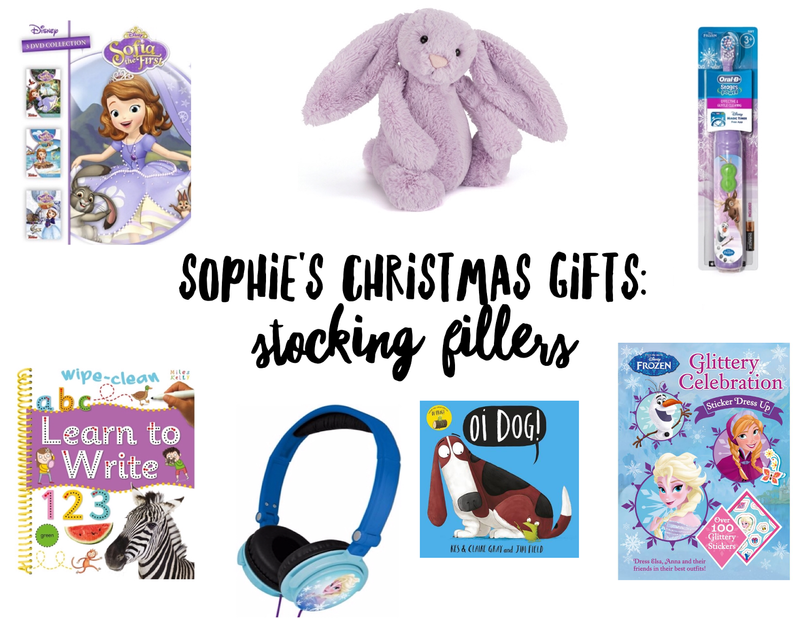 What have you bought to go in your kids' Christmas stockings this year?